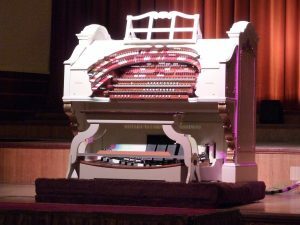 The Worthing Wurlitzer began its life in the Troxy Theatre, Stepney, where it opened in 1933 with Bobby Pagan as the organist. In 1988 the BBC Playhouse (ex. Empress Ballroom Wurlitzer) was acquired and the process of enlarging the Worthing instrument began. Other ranks were also purchased, including a Horn Diapason, Clarinet and the ‘Style D’ Trumpet from the original George Wright studio organ. International experts such as Lyn Larsen, Walt Strony, Ron Rhode, Hector Olivera and Simon Gledhill all contributed to the revised specification and console layout. So significant were the console modifications that a completely new stop rail had to be a constructed, using electric stop key actions and 264 stop keys. The design, based on the ‘Fox Special Wurlitzers’ took two years and some £8,000 to complete. The new 22 rank organ reopened on the 23rd February 1997 with Nigel Ogden, Iain Flitcroft, Robin Richmond and Simon Gledhill at the console. The organ is used for a full range of functions from regular monthly concerts to ballroom dancing and civic functions. All of the great organists have performed at Worthing including Lyn Larsen, Phil Kelsall, Thomas Trotter, Carlo Curley, Hector Olivera, Simon Gledhill, Ron Rhode and Walt Strony to name but a few. Greats of the past have included Ernest Broadbent, Bobby Pagan, Louis Mordish, George Blackmore, Robin Richmond, Ena Baga and Douglas Reeve.